This building exhibits the Renaissance Revival style but with an eclectic mix of details—Roman to Colonial Revival. It is two stories with a symmetrically organized, center entrance, five-bay, articulated front facade. The wood-framed house has been resided with either vinyl clapboard. It has a hipped roof clad with asphalt shingles and having shed and gabled dormers. The cornice has a band of small dentils. There are three brick chimneys—one a front wall chimney, one on the interior and one on the side wall between the main house and a two-story left side ell. An entrance portico has curved sides to a projecting center entry section, paired Ionic columns, modillions on its eaves and swag decorations on the frieze. The front door surround has short, ½-length sidelights and transom with Roman-styled cross-in-circle design for the leaded glass. The intact front door has a three-light window above six square panels in three rows. On the second floor over the entrance portico is an arcade with seven openings having fanlight transoms and 3-o-3 windows. A small shed dormer with four horizontal windows at the roof peak is also centered above the entrance. Flanking the center entrance portico are two-story pedimented pavilions with modillions. These have single double hung windows with elaborate pedimented headers in a shell design. The outer bays of the main house have paired windows on the second floor with swag decorations on aprons. A single first floor window below each second floor pair has arched broken pediments with urn at center and Ionic pilasters. A two-story, two-bay-wide, hipped-roof wing off the left side is slightly recessed. The windows appear to be intact and primarily 6-o-2 double hung with molded trim. A rear one-story glazed porch with hipped roof extends across the entire width of the main house and has an exposed basement below with tuck-under garages. The house has a stone foundation. A metal exterior spiral stairway/fire escape from a right-side dormer has been added. A semi-circular driveway off Cliffwood Street is centered on the front entry and has paneled masonry piers topped with lantern light fixtures flanking the two entrances. A metal fence extends between and beyond them along the front property line. Chain-link fencing encompasses the lot on the remaining sides. There is an in-ground swimming pool in the back yard. The property contains a variety of mature deciduous and coniferous trees and shrubs. “Well known architect in Boston, associated in partnership with Arthur Rotch from 1880 to 1895, subsequently practiced alone until four years prior to his decease. He was born at Concord, N. H., son of William Tilden, noted Unitarian clergyman in Boston, and received an early education a Phillips Exeter Academy. Taking up Architecture as a profession, the young man began his training in the Boston office of Ware & VanBrunt. After attending classes at Lowell Institute (forerunner of M. I. T. in Boston) Mr. Tilden continued his studies in Paris in Atlier Vaudremer of the Ecole Des Beaux Arts. In 1880 he opened an office in Boston under the firm name of Rotch & Tilden, and over a period of fifteen years the partners maintained one of the most active architectural offices in New England. They also designed buildings in New York, Washington, D. C. and Charleston, S. C. In Massachusetts the more important examples of the firm’s work include the Town Hall in Milton, Sargent Normal School and Gymnasium at Cambridge, the Art Museum, Wellesley College, Plymouth High School, Jesup Hall at Williams College, Williamstown, Public Library in Billerica, the Blue Hills Observatory, Milton, and the American Legion Building in Boston. 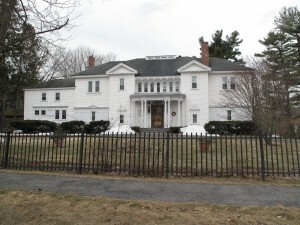 Mr. Tilden was also identified with the design of many suburban homes, among them “Ventfort Hall” and “Belvoir” on estates in Lenox. Known as Osceola, it was built by Mr. and Mrs. Edward Livingston in 1889. Mrs. Dwight Collier bought the house from the Livingston’s. Mrs. Augusta Dee Whitman lived in the house until 1966 when she sold the house that became a retreat house to General Electric Co. In 1969, John and Marlene McCarthy lived in the house. The McCarthy’s sold the house in 1979 to the Backers who resided there until 1983. Set Seven Corporation owned the property from 1983 until 1986 when Joy and E. Scotty Farrelly bought the property. The Farrelly’s have used the house as a bed and breakfast called Cliffwood Inn and as a residence.